Bruschetta - not just dried toast with stuff on top! Normally in the UK I avoid ordering Bruschetta in restaurants. Overdried bits of bread topped with nice but overpriced bits of whatever, mostly tomato paste based and served ice cold. Thanks to my trip to Tuscany, I’m something of a Bruschetta convert now though. What made these different? Well, first of all, none of them were freezing cold. Some were warm, others just room temperature. It made a real difference to the flavours. Secondly, they were served on truly excellent bread. Not yesterday’s stale leftovers with a bit of garlic and oil to cover up the staleness. And thirdly they were not entirely tomato based – and those that were used chunks of real, fresh well flavoured tomatoes that had never seen the inside of a fridge. 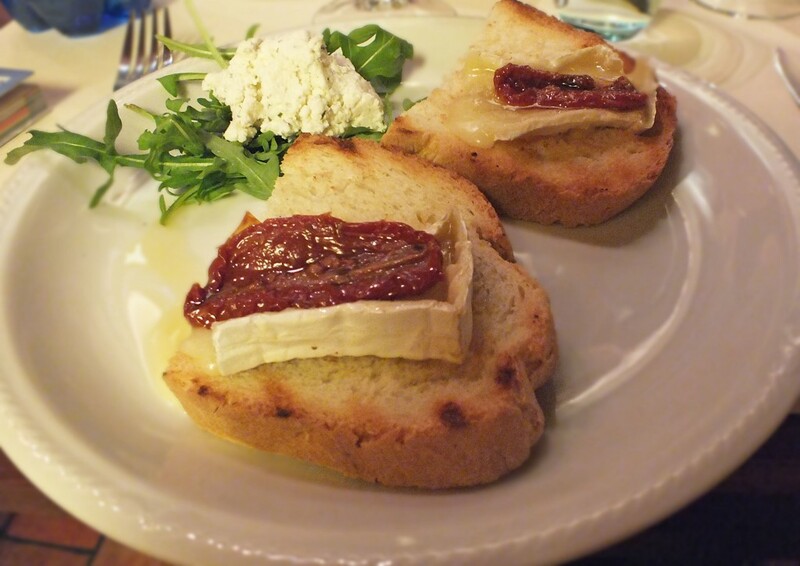 Firstly – Brie and sundried tomato with ricotta. This was just melting brie topped with warm sundried tomatoes and a side portion of ricotta which just took the edge off the mixture. 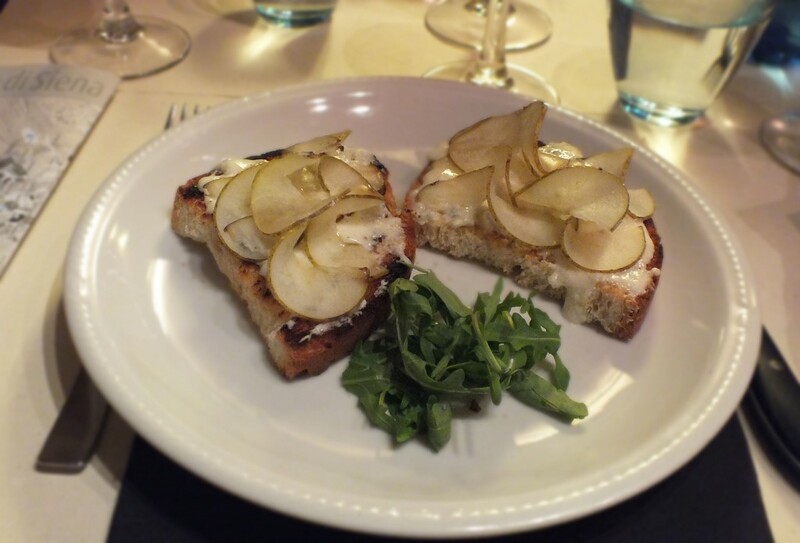 Then Gorgonzola, honey and pear which tasted as splendid as it looked. The cheese had been just taken to melting point and then topped with a little honey and very fine shavings of pear. 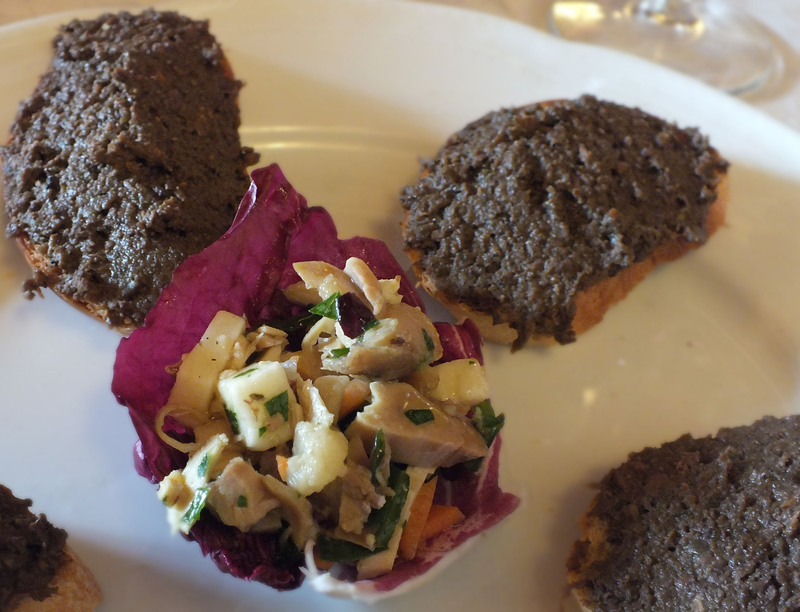 Chicken liver with black olive appeared to be a classic in this region. We had two or three iterations of the mixture, which was lighter in flavour and texture than tapenade alone – it’s a mixture that you can adapt to your own palate by varying the ratio of liver to olive. 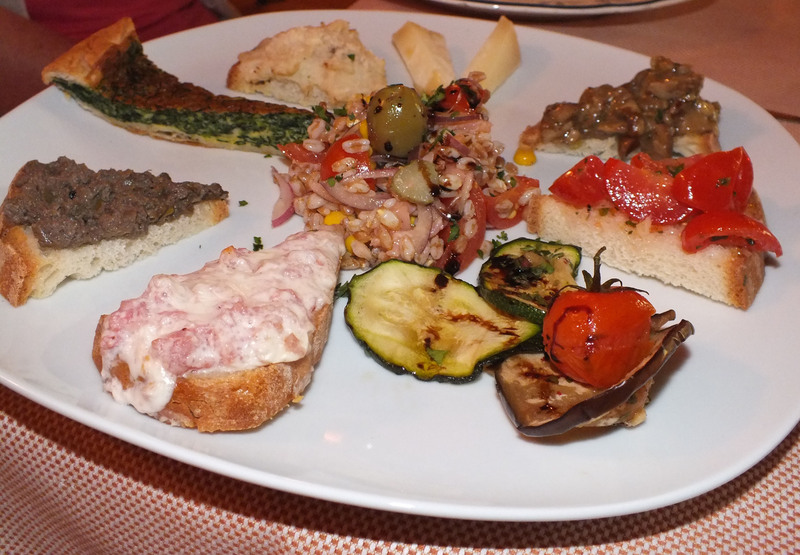 And finally a example of a plate of mixed antipasti which included a ‘proper’ tomato bruschetta, one with wild mushrooms, a warm one with white truffle and artichoke cream and another warm bruschetta with ham and cheese one. There’s also a black olive and chicken liver one with a much higher proportion of liver which gives it the lighter colour and a more subtle flavour. These are something I do plan trying at home. They are Bruschetta, but not as I know it. While I am sure they all involved olive oil, some of them were far too delicately flavoured to involve garlic. And the bread was still soft as you bit through the toasted outside. I love bruschetta, but agree, it has to be eaten in Italy. Sadly here, even in the restaurants that specialise in Italian food, they can’t quite master the art of making bruschetta. Oh Fiona bruscetta is my favourite thing. I am blown away by some of those combinations, esp the gorgonzola one. Looking forward to more Tuscan delights! I’d never had ‘warm’ toppings…and they were really gorgeous. The gorgonzola was lovely – the artichoke and white truffle cream was too, though the pic is appalling and we ATE it before I could take a separate piccie of it!